Our first stop of the day was at Northwest Cellars (@NWCellars), which is located in a warehouse area in Kirkland off of 124th Ave. Luckily, great signs lead the way from the main road to the tasting room, which is small, but cozy. 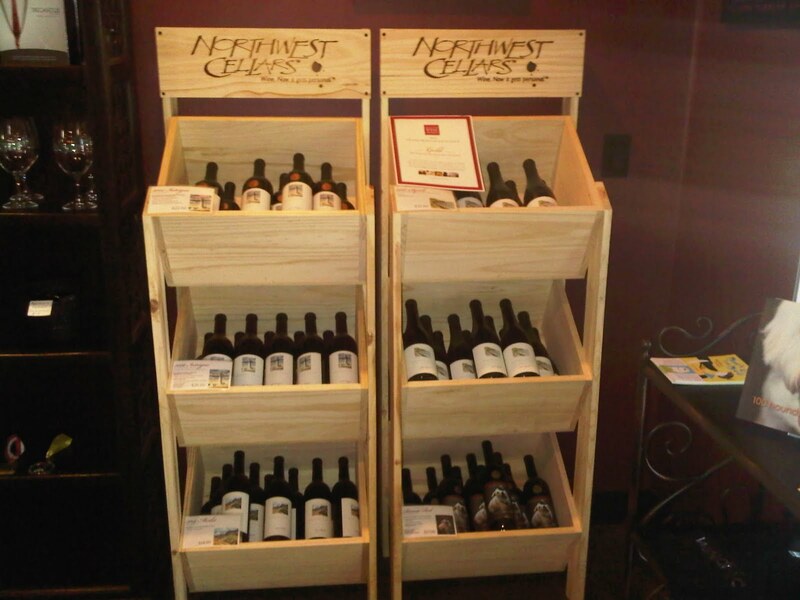 We decided to visit Northwest Cellars because we had both purchased a Living Social deal quite a few months back that was for a tasting and 4 bottles of wine for just $40! Both of us purchased the deal and set a future date to visit the winery together to redeem it. 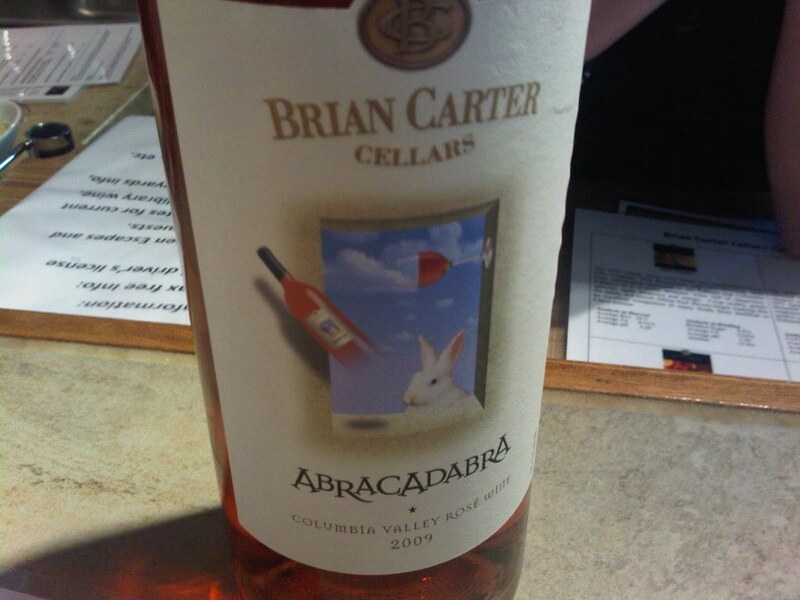 This was great exposure for this winery, as I’m sure that we weren’t the only ones that had never been into the winery before when we purchased this. It was a great way to bring in some new people to try the wines! 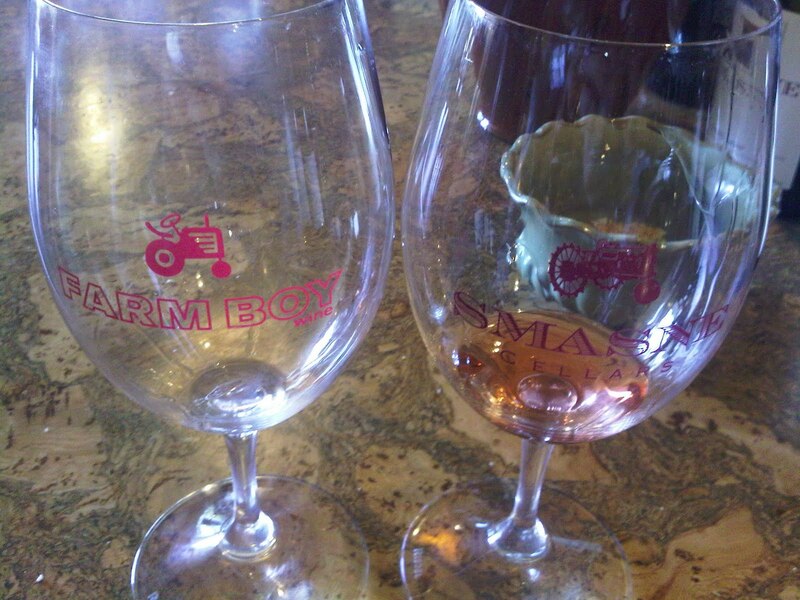 We tried several of their wines, including the 2008 Adagio, a 61% Sauvignon Blanc and 39% Chardonnay blend. This was a Gold winner at the Seattle Wine Awards and I really liked the Sauvignon Blanc flavors in this. It would pair nicely with food. We moved on to the 2005 Merlot, which has a great aroma and is a very classic and peppery Merlot. 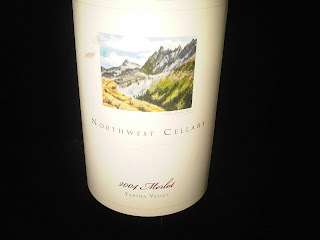 We were also able to try the 2004 Merlot, which has a much different nose than the 2005. 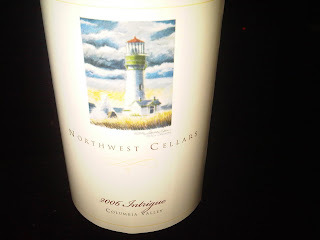 I liked the 2004 much better than the 2005, which goes to show what a little bit of aging can do to a wine. This would also be great paired with food, maybe some BBQ? Next we tried the 2006 Intrigue, which is a great blend of 51% Cabernet, 22% Syrah, 18% Pinot Noir, and 9% Carmenere. I really like the added Carmenere in this wine, it is very pleasant. 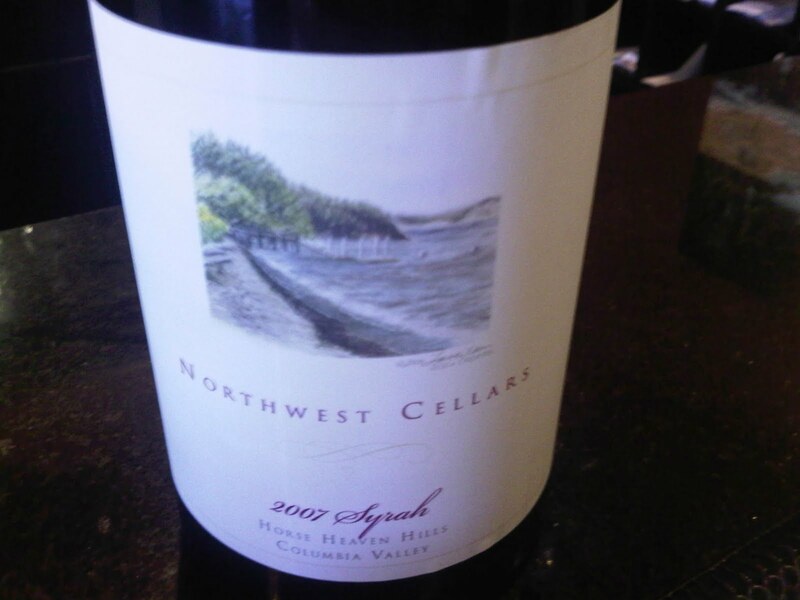 We finished with the 2007 Syrah, which is a 100% Syrah that also took Gold at the Seattle Wine Awards. This is a very small release and it was a fantastic Syrah. 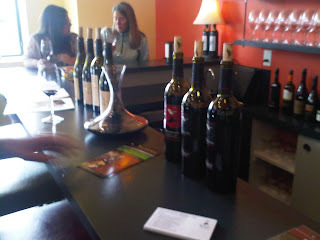 Next we headed into Woodinville and up to a winery that I had been meaning to visit for quite awhile now. Northwest Totem Cellars (@NWTotemCellars) is located on the private property of owners Mike & Kate Sharadin. Their tasting room is in their bright and spacious kitchen inside their home! I had met both Mike and Kate in the past, and worked with them for Passport to Woodinville at the Hollywood Schoolhouse earlier this year. I was so excited to finally get a chance to head up the hill to check out the tasting room. That particular day, we were the first people Kate had seen that afternoon! This was surprising since it was such a beautiful summer day that makes being out tasting that much more fun. 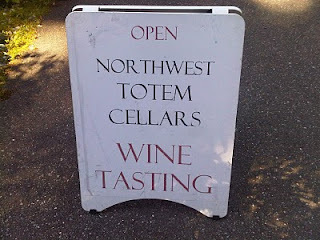 One thing I was looking forward to trying was their Salish wine that had refermented. 1/6 of their production had gone through this refermentation and was left as almost a bubbly version of this delightful Viognier and Riesling blend. They were selling this for $50/case so Caity and I took full advantage and left with a case of our own to share! We also tasted the 2007 Cab Franc, which I have tasted before. This has great aroma and flavors and is a big favorite of mine. We also tried the 2007 Low Man Red, which is a Bordeaux blend, and a great blend indeed! We finished with the 2007 Cabernet Sauvignon which is a great complex Cab with amazing flavors. I am never disappointed when tasting through Mike’s wines; he makes such great varietals that offer amazing flavors! Off of a recommendation from Kate Sharadin, we headed back down the hill to Brian Carter Cellars (@briancarterwine), which is located right near the Hollywood Schoolhouse tasting area. They have a cute little yellow house with a spacious deck for their tasting room. 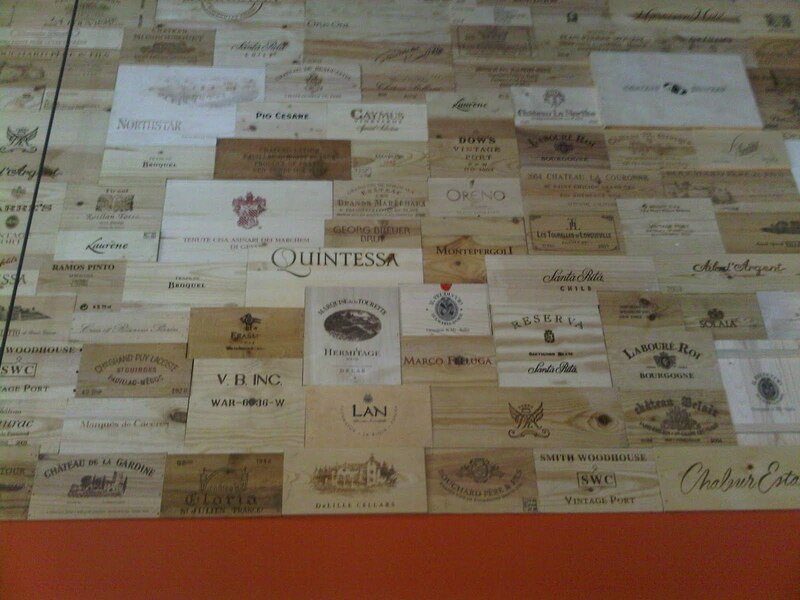 I had never visited the tasting room before, but had heard great things about the wines from other people. 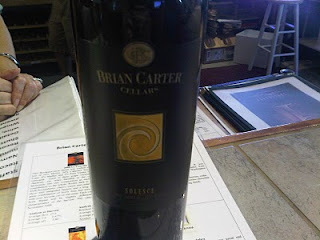 Brian Carter is well known for his blends, and I must say, he does them very well. He has 14 different vineyards and 17 different varietals this year. We were welcomed warmly when we entered the tasting room, and it was such a treat to chat with the ladies behind the counter during our visit. We started our tasting with the 2007 Oriana, a white blend of 52% Viognier, 35% Roussanne, and 13% Riesling. This is a great and refreshing blend that was perfect on this hot summer day. Next we tried the 2009 Abracadabra Rose, which is a Rose of Sangiovese. This is a small production wine and is definitely one that I left with! I am a sucker for a good Rose, and I am so happy to keep finding such great ones. Next up we had the 2006 Byzance, which contains grapes similar to those found in the Rhone Valley of France. 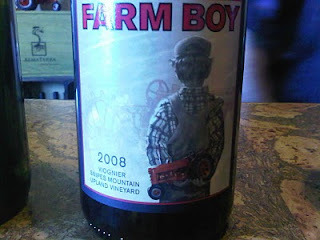 This blend contained 61% Grenache, 21% Syrah, and 18% Mourvedre. This wine has flavors similar to that of a Châteauneuf-du-Pape. On this day, it could have been just a bit colder in temperature, but it was great all the same. We then tried the 2006 Le Coursier, a 39% Merlot, 34% Cabernet Sauvignon, 14% Cabernet Franc, 8% Malbec and 5% Petit Verdot. This is a big blend and is Bordeaux style. We finished with the 2005 Solesce, which is a wine club only pour, but the lovely ladies in the tasting room were kind enough to let us try some as well. This wonderful wine is their signature Bordeaux-style blend. This is a mix of Cabernet Sauvignon, Merlot, Petit Verdot, Cabernet Franc and Malbec. It has great aromas and great flavors that would pair well with just about anything. 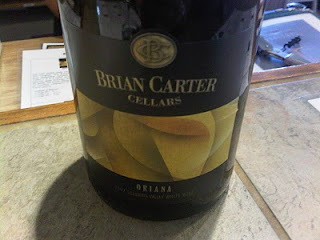 What a treat and an overall great time tasting at Brian Carter Cellars (Our great experience on this day prompted me to bring back my family a few weeks later for a tasting tour on my mom’s birthday. As I expected, the wines were a big hit yet again!). We headed over to the Woodinville Warehouse District and first hit Barrage Cellars (@BarrageCellars), a winery I have visited several times in the past and always enjoy. Rebecca was holding down the fort in the tasting room on this day, as Kevin was out of town on a business trip. I have tasted through their wines on several occasions, and I enjoy them a lot. 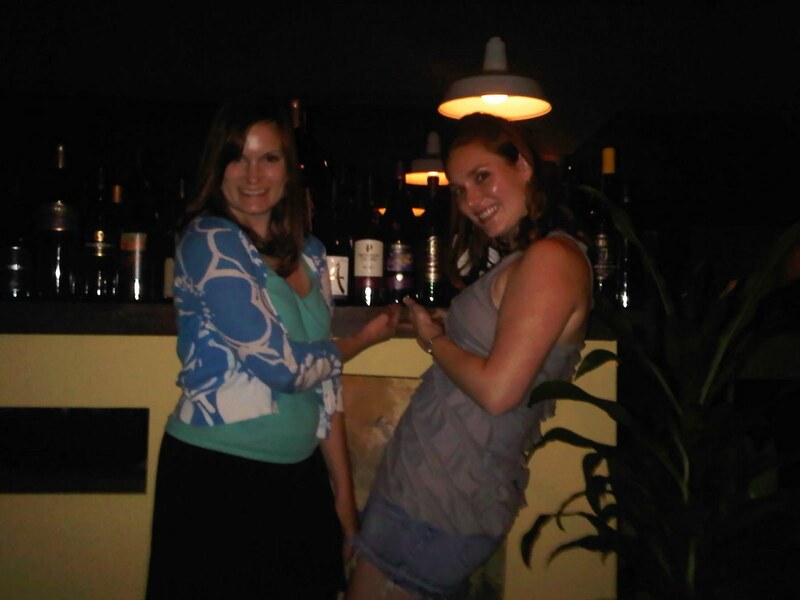 Caity really enjoyed the 2008 Nuclear Blonde Chardonnay, and we both liked the 2007 Trifecta Merlot on this day. And while we didn’t taste it this time around, I also really like their 2007 Outcast Cab Franc, which I wrote about a few months back. 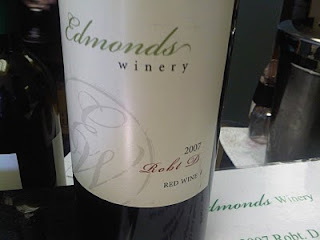 We scooted just across the parking lot and into Edmonds Winery (@EdmondsWinery), maker of wine I had tasted at an event at Russell’s (@RussellsDining ) back in the spring. At this particular event, I also received a coupon for a free tasting in the tasting room, which is what brought us in on this day. We started our tasting with the 2009 Rhapsody, a Semillon and Sauvignon Blanc blend. 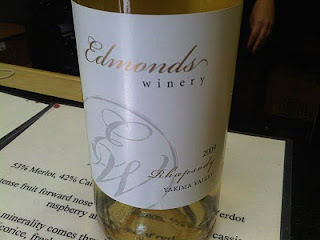 This is a crisp white wine, another of those warm weather wines that was perfect on this day. We both really enjoyed the 2007 Robt D wine, a 20% Cabernet Sauvignon, 20% Malbec, and 60% Cab Franc blend. This is great to the nose and as one of us quoted “let’s make a candle out of this!”. It just has an aroma that was pleasant and a taste to match. 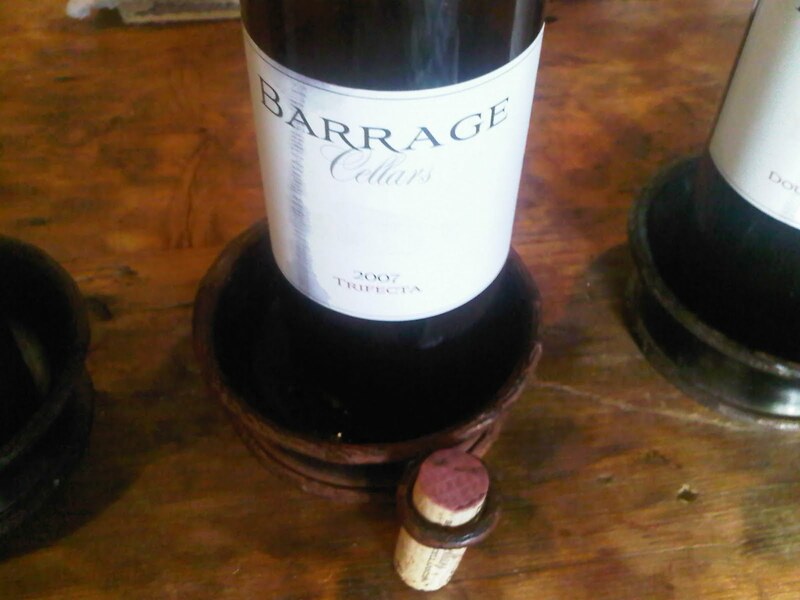 Their 2007 Cabernet Sauvignon is a 93% Cab Sauv, 5% Cab Franc, and 2% Malbec. This is a fairly small production wine, at just 126 cases produced. This is a gentle cab, with a relaxed finish. We walked down the way to Gordon Brothers Winery (@gordonwines), which is a winery where I had joined the wine club back at a tasting day back in May. I really enjoy their tasting room, with wine displayed all around and even several fun gift items also (I definitely added a Celebration style Eisch decanter to my Christmas list after visiting here!). Here we tasted a 2006 Syrah which is a fantastic wine! 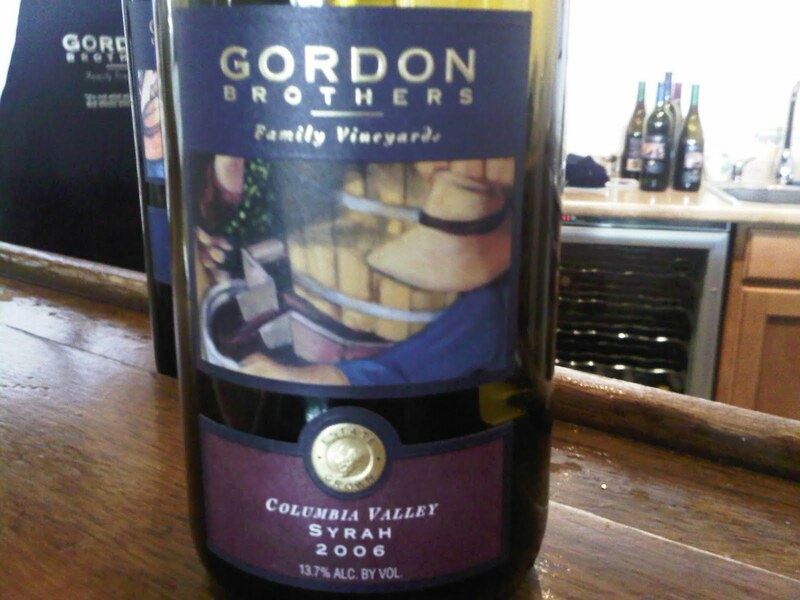 This Columbia Valley wine is very flavorful and great to the nose as well. 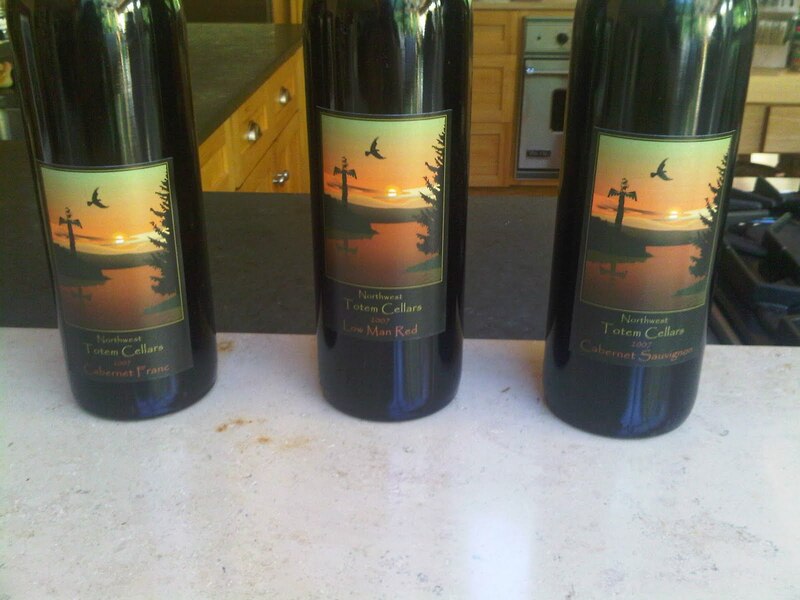 Our favorite at this stop was the 2004 Tradition, a blend of 52% Cabernet, 43% Merlot, and 5% Syrah. 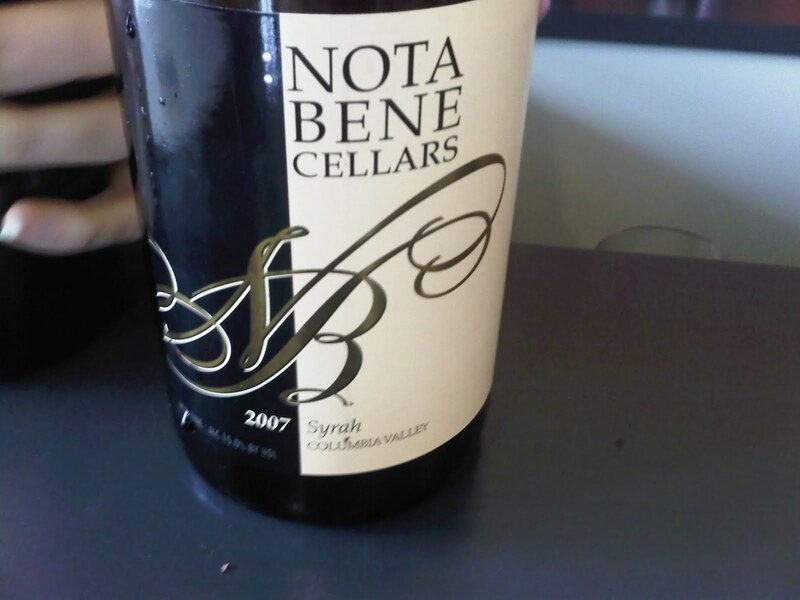 This is a very elegant and smooth wine that rates 90 points or more year after year. Caity and I split the purchase price of this bottle, which will force us to drink it (and enjoy it!) together sometime in the (hopefully very near!) future. We finished up our day at Smasne Cellars/Gard Vintners (@smasnecellars/@gardvintners), just across the parking lot area. This tasting room is always a favorite, and their extended hours make it easy to finish up a day here. They have a nice open tasting room area, with a bay door that can go up to open up the area on a nice day (such as this one). At this point in our day, we were warm from the weather and had been tasting quite a bit, so we stuck with some white varietals at this visit. We tasted the 2008 Farm Boy Viognier, which is a Snipes Mountain Upland Vineyard wine. This is a nice wine, and the label has a great back story (did you know that it’s based from a photo of Robert Smasne from when he was a young boy?). 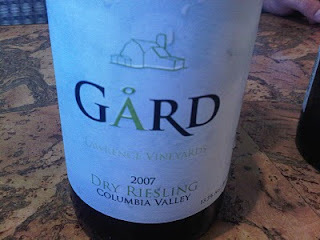 We also tried the 2007 Gard Dry Riesling, a Columbia Valley wine. This was a very nice and crisp wine and not too sweet, as some Rieslings tend to be. We also enjoyed the 2008 Smasne Konner Ray White, from the Upland Vineyard. I always enjoy this wine. Robert also makes a Konner Ray Red as well, and both wines are named after his son! After a long day of tasting, we were hungry girls, so we headed nearby to a favorite place: Russell’s (@RussellsDining ). 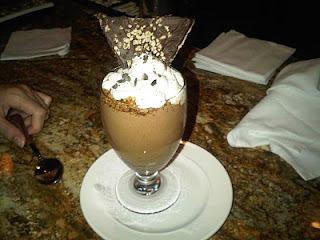 We sat at the bar and enjoyed several appetizers and even a fantastic chocolate mousse for dessert (thanks Rob!). 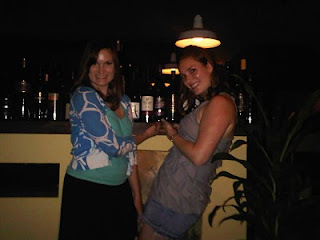 Of course we had to go find our bottle that was put up on the wall after our Wine & Dine tasting day back in May. It was right where we left it, so we documented it for proof! What a great day of tasting with a great friend! I'm so excited to write about a place that is quickly becoming one of my favorite hang out spots here in Seattle. Greenlake Wines (@grlakewine) is a wine bar and wine shop located in North Green Lake that has been open since March 2010. The shop is owned by Richard Kinssies, who you may remember me mentioning when we visited his Seattle Wine Outlet (@SeaWineOutlet) store back in March for our Washington Merlot Tweetup. 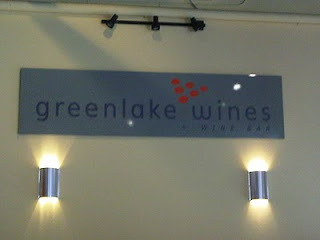 Greenlake Wines has a great spot on a busy corner and is an inviting and all-around fun place to hang out. One of my favorite things that they have started is a Thursday night complimentary wine tasting where they will bring in one or two winemakers or distributors to showcase several of their wines. The event, which runs from 5-7pm on Thursday evenings, brings in quite the crowd to the shop! 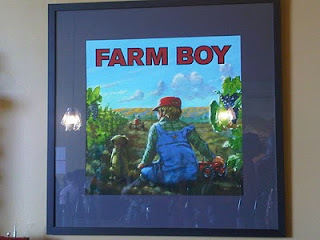 I have been fortunate to attend several of these tastings over the past few months, and I'm happy to be able to share all the fun wine finds I have made at these weekly events! My first Thursday tasting was for two separate wineries. 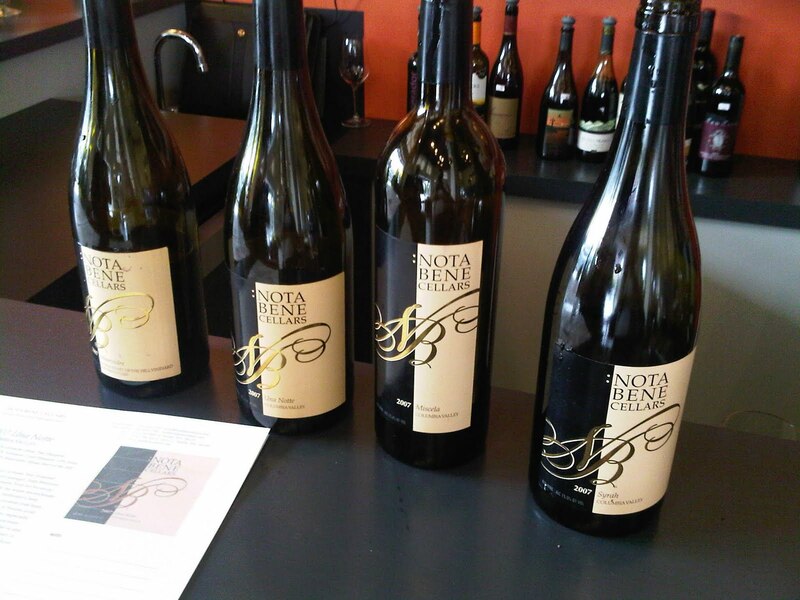 Nota Bene Cellars and Renwood Winery were in attendance, each pouring a variety of their wines. I tasted through the four Nota Bene wines first, with the 2007 Mourvèdre and 2007 Syrah being my favorites. The Mourvèdre was slightly spicy, but not too much so. 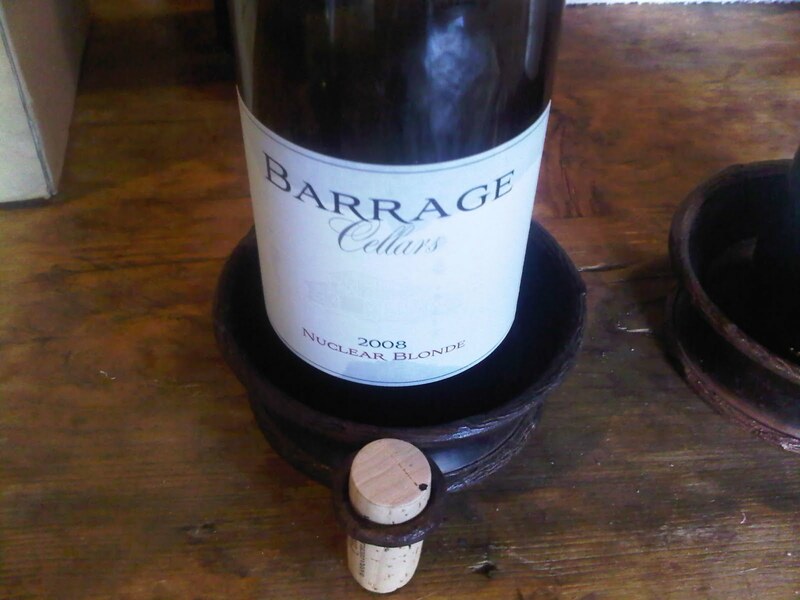 It was a very tasty and well rounded red and only 25 cases were produced! The Syrah was 84% Syrah, 8% Mourvèdre and 8% Grenache and had a great nose and structure. 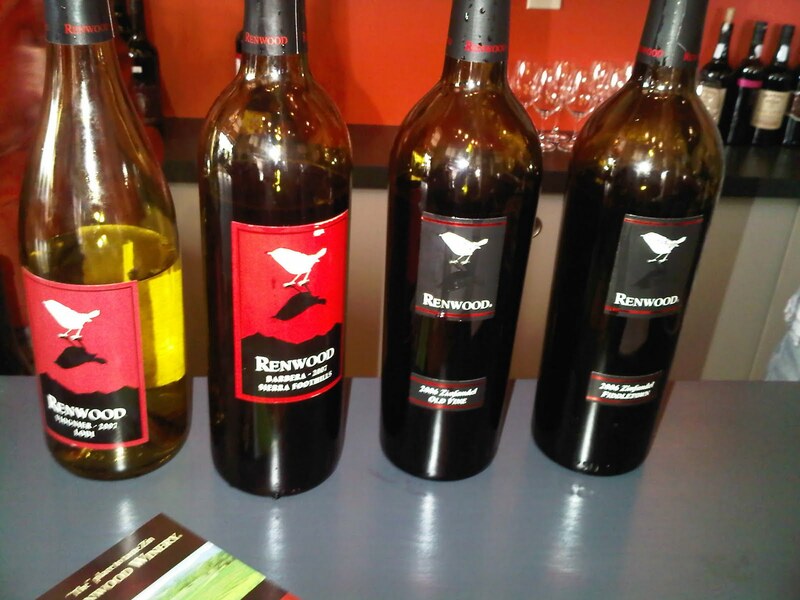 The Renwood wines are a great bargain for such great juice. The 2007 Viognier was another one of those great summer wines, and at $10/bottle, is hard to beat! The 2007 Barbera was probably my favorite of the Renwood wines. This is a very fruit forward wine from the Sierra Foothills in California and is another $10/bottle steal! I definitely left with two bottles! 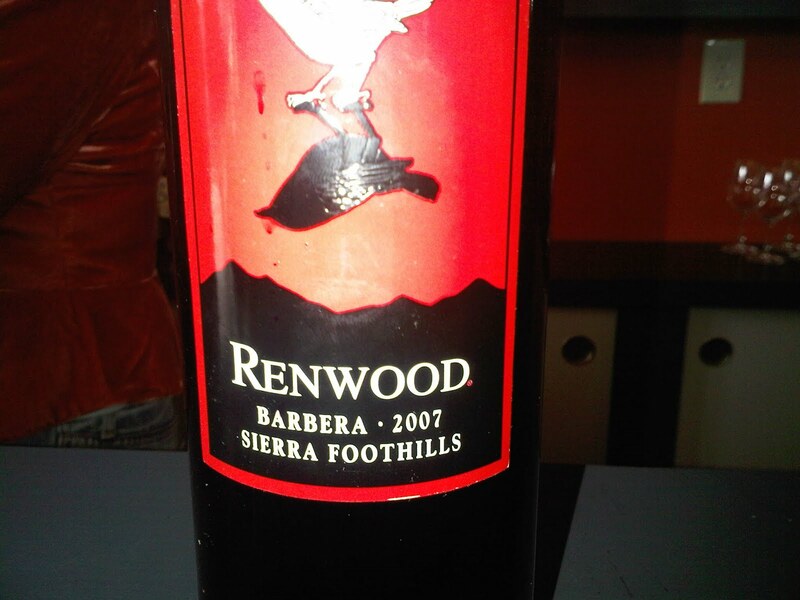 The 2006 Old Vine Zinfandel is Renwood's highest production wine and is their lead item. Flavors of cherry, berry and sweet vanilla come forward in this. The 2006 Fiddletown Zinfandel comes from the highest elevation appellation in California. This has big flavors, but remains soft. 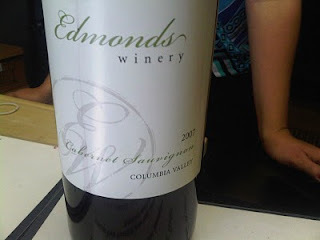 Of the several Zinfandel varieties I tried at this tasting, this was my favorite. 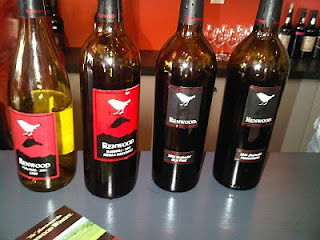 You might remember my Bags & Bottles post from back in March where I mentioned that I wanted to try more Renwood wines. I'm so glad I finally had the opportunity! 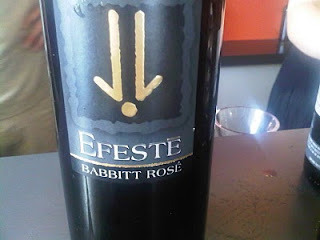 The next Thursday tasting I was able to attend was for Efeste (@Efeste), a Woodinville winery that I had not had the opportunity to visit as of yet. Winemaker Brennon Leighton was on hand to pour the wines and answer questions about them, what a character! It was great to meet such a charismatic winemaker and to have him on hand to give us such great information about each wine being poured. 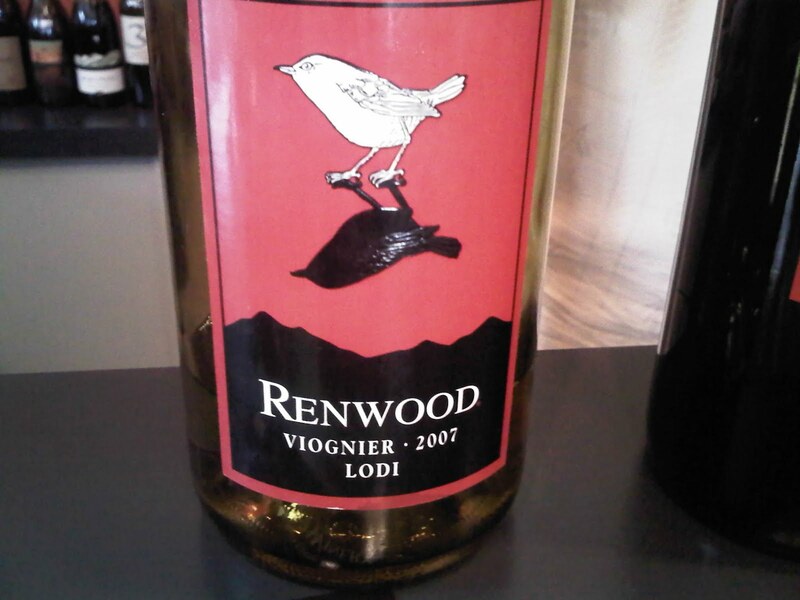 The 2009 Feral Sauvignon Blanc was our first wine, a 100% Sauvignon Blanc from the Columbia Valley. The 2009 Babbitt Rose was a great Rose (and I do love Roses!) that as Brennon stated, has "everything but the kitchen sink in it!". The 2009 Riesling is an Evergreen Vineyard wine that is very sweet and very crisp. This would pair well with food. Efeste's 2007 Final Final is a 56% Cabernet Sauvignon, 42% Syrah, and 2% Mourvèdre. The Mourvèdre adds a bit of spice to this wine, which leaves a strong aftertaste on the palate but was otherwise enjoyable. 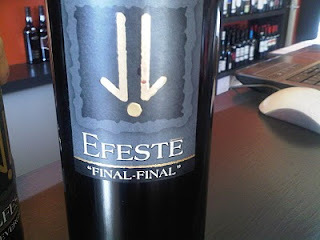 Before today, I had not had the chance to experience Efeste wines, and they proved to be a great addition to my wine collection! My most recent Thursday tasting adventure at Greenlake Wines was for an "East vs. West" tasting, where we sampled wines of India and wines of Argentina. Most of us have likely tried Argentinean wines before, as they tend to be fairly common. 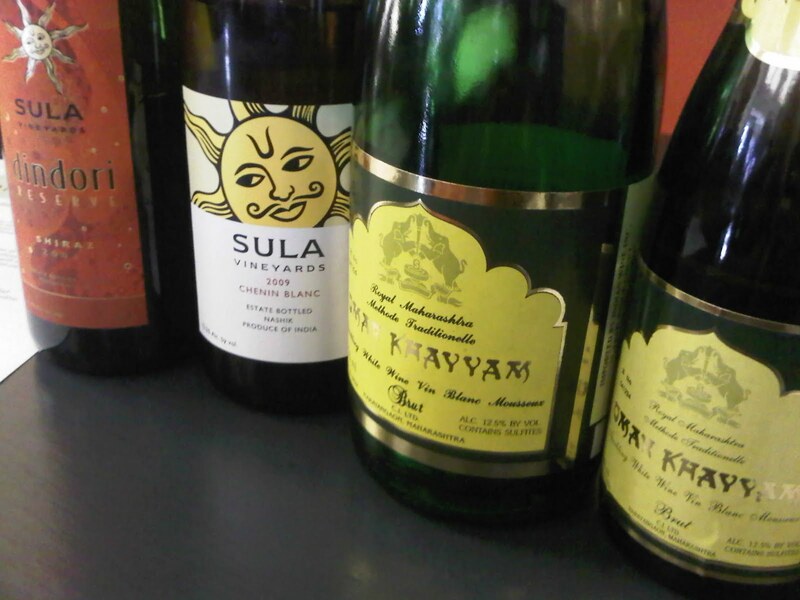 I had never even heard of wines from India! What a treat! The sparkling wine and Cabernet Sauvignon from India were my two favorites of the evening. This tasting was so crowded that I hardly had a chance to take any good tasting notes, but I can say this much: they tasted good! August 5th - Tranche Cellars (@Tranchecellars), the sister label to Corliss Estates; and Ward Johnson Winery (@WardJohnsonWine), an urban winery from Seattle. August 12th - Covington Cellars (@CovingtonWine) of Woodinville; and Two Vintners Winery (@TwoVintners), another label from winemakers Morgan Lee and Donavon Claflin of Covington Cellars. August 19th - Celebrate Spain! Wines of Spain featured. August 26th - Stella Fino Winery (@StellaFino) of the Walla Walla Valley and a second winery TBD. You'll have to attend to find out! A new addition to Greenlake Wines is their new Happy Hour, which is from 5-7pm every night. 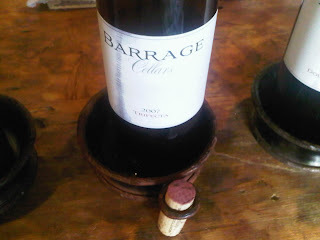 This debuted at this past Thursday night's tasting and appeared to be a hit with the crowd! This new Happy Hour features 3 wine choices for $3/glass as well as new menu items for just $3/each! A glass of wine and an inexpensive snack seems like a great way to kick back after work! I look forward to many a Happy Hour in my future!